Silent Hero Saves The Day! On Sunday, May 19, a painter made the decision that he would finish some cabinets in a small restroom in a mercantile. He took his airless sprayer with 50 feet of hose, one gallon of flammable finish into the one-toilet/one-sink restroom. 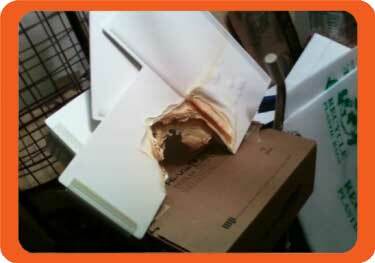 Using the restroom fan, he sprayed several cabinet doors and was in the process of spraying the cabinet when the ignition of the vapors turned the room into an inferno. The ceiling tiles were blown down in the room, just outside the room and for approximately 12 tiles into the suite. Speaking to the owner of the mercantile, she stated that the store’s grand opening was scheduled for that Monday, May 20. She stated that she had just stocked the store with $100,000 of paper products. None of the merchandise was damaged since the fire was contained to the restroom area only. Mark Baumann, the business owner was educated by our office and the building department about the advantages of fire sprinklers during the renovations of the old building. Mr. Baumann made the decision to install a voluntary NFPA 13 fire sprinkler system, after he made an educated business decision using insurance savings, construction cost and wider occupancy opportunities as his guide. When asked about the fire sprinkler discharge, Mr. Baumann stated he is very happy he made the investment and thanked us for all the education and help we provided him along the way. In 2008, Baltimore City (Maryland) Fire Department Lieutenant Derrick Ready endeavored to reduce the number of intentional school fires by 50 percent in just five years. Employing classic community risk reduction strategies, Ready became a presence at local schools, walking the halls and talking to students. In March 2013, Lieutenant Ready received the Hometown Hero Award for helping to reduce school fires by 86.7 percent. Read the story.